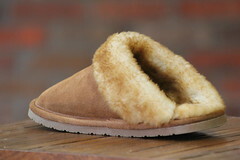 Looking for a stylish moccasin that you can wear both indoor and out? This ladies moccasin has a Australian sheepskin interior, water-resistant suede exterior and a rubber sole for those outdoor trips. 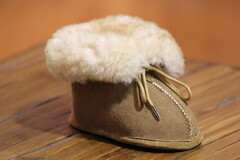 The leather lased accent this moccasin for an added touch. - Comes in whole sizes only, if you wear a 7 1/2 purchase an 8.